The murder of rapper Nipsey Hussle prompted LA gangs to march for peace in Crenshaw. Hussle, whose real name was Ermias Davidson Asghedom, was shot dead outside his own shop, Marathon Clothing, in South Los Angeles on March 31 in an attack which wounded two other people. CCTV footage revealed the 33-year-old was shot a number of times, after he and the suspect engaged in a reportedly tense conversation. The rapper was taken to an LA hospital, but pronounced dead on arrival. His death prompted an extraordinary display of peace between several LA gangs as members gathered in Crenshaw, near where Hussle was killed, on Friday to show their love for their the rapper. 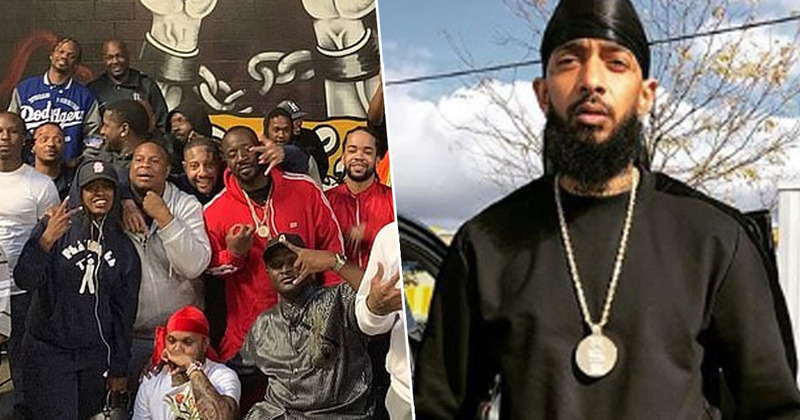 According to TMZ, the march was set in motion on Thursday evening when gang leaders from Watts, Compton, L.A. and Inglewood all met up to talk about a cease-fire. The leaders reportedly discussed putting the word out in their neighborhoods to put down their firearms and show unity in response to Hussle’s death; a movement which started with the Friday afternoon march. Members of all gangs gathered and walked together for a couple of blocks, ending up outside Hussle’s shop Marathon Clothing, where people had laid out flowers, balloons and pictures in honour of the rapper. There reportedly hasn’t been this kind of peace between so many L.A. gangs since 1992. Community leader, Big U, spoke to TMZ about how everyone was on the same page when it came to marching for peace. We’re having a gang rally so all the different gangs from LA can get together and come celebrate the life and the gift for Nipsey. A lot of people called and said they wanted to get together and come to the vigil and pay respect because Nipsey was the first real LA artist that was from LA… to die the way he died. Bringing in a lot of different gangs that people have been waring with for years is really kind of dangerous… but we tried to get the people who want to be here from different gangs, and it’s beautiful. They Still Trying 2 Hate On Our Hard Work and Love …… But More Then Anything ToDay Was A Day Of TRUST * BY EVERY MAN WHO CAME AND PUT THEIR LIFE IN the Hands of the Men/Women From CRENSHAW…… I THANK YOU FROM THE TOP AND BOTTOM OF MY HEART ….. TODAY WAS MADE BY GOD/ALLAH…. LETS KEEP PUSHING THE LONG WAY ….. Do it for the Babys……. ( a Special Thanks to #TANYA & #AD FOR PUTTING THIS EVENT TOGETHER ) ILL FOLLOW A GREAT TEAM…..
29-year-old Eric Holder Jr was accused of Hussle’s murder and arrested on Tuesday. He pleaded not guilty and had his bail set at $5 million. Hopefully the peace among the LA gangs will last for some time.